Frozen in time July 9, 2009, hmm? Well, almost. I have to admit Segacollection.com became a 'when I have some spare time and feel like it' project. My heart lies with Segadatabase and its subdivisions; my Odds & Ends page, SEGANEWS.NET and the Segadatabase Youtube channel. That doesn't mean I'll let good old Segacollection die, but updates will be rather infrequent (as you might have noticed!). To end the Segacollection.com year on a positive note I added 20 Dreamcast shortcuts. Read them HERE. Till next year! The Segacollection on the road crossword puzzles were downloaded plenty of times, so it was time for a new one. Check out volume 8: 3rd party generation. I added another classic interview. This time it's Yasushi Endo, creator of the Keio Flying Squadron series. Look out for more classic interviews in the future. In the mean time keep checking Segadatabase.NET and SEGANEWS.NET! Also, keep an eye on the boards for some early/BETA pictures of Sonic the Hedgehog and Asterix (SMS)! The lack of updates on this site became a little painful to watch, so here's a small update. I updated the online gaming and link-up features and fixed a lot of dodgy spelling errors in the Megadrive portable review (guess it was late that day, hmm). Expect some more updates soon, hoorah! At this moment I'm sadly unable to do weekly or even monthly updates to Segacollection.com, but remember there's always the daily SEGA news blog on Segadatabase. I've added a review of the recently released portable Megadrive by AT Games. Happy holidays! I add a long interview with team Kalisto (RIP) on Nightmare Creatures 2. Quite a good read I reckon. *The general lack of new SEGA software to look forward to. *The new season of Fort Boyard on TV5 Monde has just started. Oui! *Iron Man. Oh dear, oh dear, oh dear.. *The Club on Xbox Live, not bad really! The unreleased Saturn snowboard game Chill was uncovered on the boards, go check it out if you didn't see it by now. 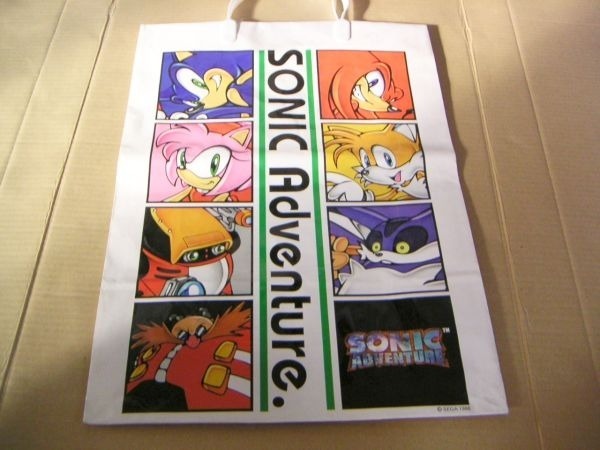 I also added some new pictures to the Sega Lots special and uploaded some Saturn magazine advertisements in the gallery. 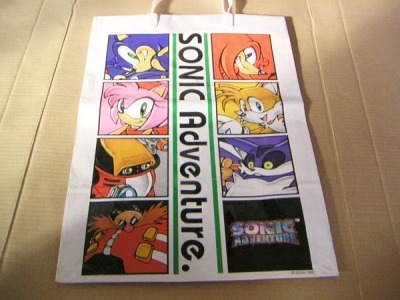 The picture of the month shows the Sonic Goodie bag that was given away to the crowd on the first public playtest of Sonic Adventure, August 22nd 1998. Gifts inside included a limited edition t-shirt and program. A new Segacollection on the Road for all you puzzlers out there; Master System Matters! Expect another update next Monday. For now keep an eye on the boards where I'll post screens of an another unreleased Saturn game a.s.a.p! SEGA's release schedule became quite a lot emptier as Sega Superstars Tennis, Viking: Battle for Asgard, Condemned 2 (scheduled for 4/4 but you should be able to find it in various shops already) , Football Manager 2008 (PC) and Universe at War were released in the last couple of weeks. Quite a line-up, really. It should be interesting to see what new game they will announce for later this year.. In those weeks I've been busy playing Sega Superstars Tennis, being a judge in the Saturn homebrew coding contest, uploading some new Youtube videos, updating Segadatabase..and quite some others things besides. It seems the bi-weekly updates are here to stay. It might not be much but considering the other SEGA fansites on the net it's almost a luxury. In the mean time we had the Dreamcast.com hoax, the release of The Club, some Condemned 2 trailers (and a slight delay) and some activity at the forums (finally!). Personally I'm looking forward to the release of Sega SuperStars tennis this week. Its line-up of old-school SEGA characters and minigames should be impossible to resist for every long-time SEGA fanatic! It's been a while since the last interview (apart from the republished and magazine ones), so this interview with Sefton Hill was a welcome one. 'Till Monday the 31st! (unless something MAJOR happens that demands another update). I did another show overview; the E3 1995. The list of software was HUGE and took hours to compile. Plenty of surprises as well! February's 'monthly old picture found somewhere on my harddisk' features Picky's (of Fighting Vipers fame) skateboard! 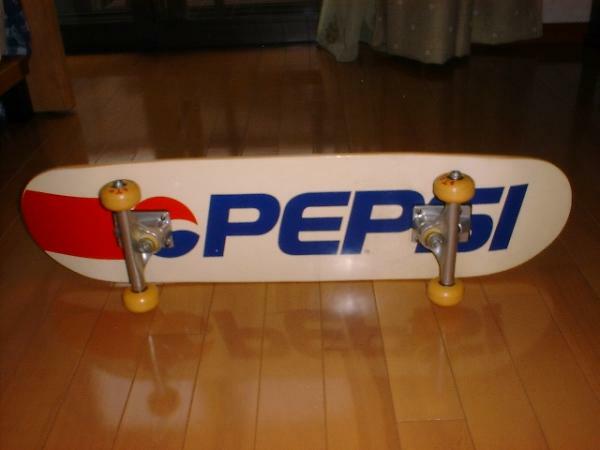 This was for sale on Yahoo Auctions (click to enlarge). I created a neat Segacollection on the Road page including the new puzzle; Things of Saturn. I also re-compiled the Saturn PAL game list (I came across plenty of errors in the old one..hmm). Screenshots to go with it will follow in the future. I've been both busy and lazy so that explains the lack of updates. I finally updated the part that started this whole site..indeed it's Mystuff. Loads of Saturn games were added to the list. I also brought back the final missing interview; Matt Godbolt. In other news; I was able to buy back the old Segadatabase.com domain, which is a good thing and will mean all the old updates can be put in the archive (when I finally get around compiling roughly seven years of updates) unedited, wheee! The 'monthly old picture found somewhere on my harddisk' contains something rather special; a 1997(!) 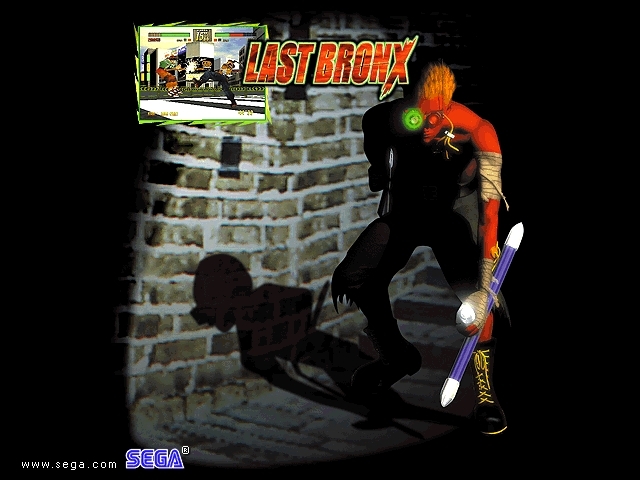 download from the Sega.com site. In 'were we really running 640x480?!' format. Think I have a Mr Bones one somewhere as well..hmm. Right, back to playing REZ HD on XBLA! I hope you all had a good new years celebration. Typically, while I was away during the holidays (which became somewhat of a tradition in the last couple of years) there's the thing that always seems to happen (guess I should go on holiday more often); the announcement of a Dreamcast release! It's not really 'hot news' anymore but the re-release of Border Down certainly is good thing. Perhaps we might see Exzeal (yes! ), Dynamite Deka EX (YES! ), Illvelo (thanks, but no thanks) or Ring Age (juuuust kidding) after all! I got another interview for your reading pleasure: Mark Voorsanger and Greg Johnson (of ToeJam & Earl fame) and I did another Segacollection on the road puzzle (warning: it's a toughie!). Oh and naturally, its solution. As 2007 is about to end, it's things of the past year that cross your mind. Personally I had a good year working as a web/flashdesigner, watching Mythbusters, enjoying some online gaming (Sega Rally, Ghost Recon..) and doing some work on the website you are looking at. Because all the updates of 2007 are on this page (I was too lazy to build the news archive..it should be done...sometime) I was able to see I updated the site 28 times. It might not be up to the standards set back in the Dreamcast days but keep in mind SEGA interest these days sadly isn't what it used to be and thats clearly shown in the amount of traffic Segacollection receives. That said, there's been lots of positive feedback concerning certain updates (such as the Dreamcast reviews) and the recent Segacollection on the road puzzles were downloaded plenty of times to make the work I put into them worthwile. For SEGA themselves 2007 must have been a very good year, sales wise. Virtua Tennis 3, Virtua Fighter 5, Medieval II: Total War, Sega Rally, Football Manager 2008, Mario & Sonic at the olympics, The Golden Compass, Streets of Rage II and Sonic 2 on XBLA...all went down a storm. I've said it before but I think it's about time people started to give SEGA some credit for what was actually a damn fine line-up of software. And looking at 2008, there's plenty to look forward to actually; The Club, Golden Axe: Beast Riders, Condemned 2 (which will sell by the truckload, mark my words), Universe at War, Empire: Total War..the list goes on. Who knows..we might actually see another Dreamcast game.. I'd like to conclude this year @ Segacollection by wishing you all a good 2008. 'Till next year! I'll be happy with anything, just keep updating! *The drab weather. *Saturn Werewolf prototype incoming. *Waiting for important mail to come in. *New Major Damage proto incoming. *Big Bottom Box, not as good as I expected! D'OH! (still not bad, though) *Daytona CCE beta incoming. *My unreliable heater from hell *Outtrigger link-up..soon a reality? *The rubbish they call TV these days. *Free XBOX live arcade action. *Bills *Sega Rally on XBOX Live. Very good indeed. *Nintendo Wii sales, are you kidding me? *Site hits picking up again. Most of you must be familiar with someone saying 'why are you always playing video games, why don't you try something else for once?'. Another thing most of you should be familiar with are long trips by car, train, bus, boat or jet. They can get a little boring sometimes, even while you bring your mp3 player, newspaper or portable gaming system. Well, Segacollection offers you a solution for both as I'm proud to present volume 1 of Segacollection on the road ! All ready in nice and easy to print format. If you're all done you can download the solution HERE. Another classic interview this time; Yuji Naka. I also did some more Game Gear shortcuts. being interviewed in a Dutch arcade (he's a pinball fanatic). This delivers some 'familiar scenery'. I think now would be a good time to send out a message to all those SEGA bashers/moaners claiming all SEGA did was releasing rubbish. Currently they posses TWO all format charts top positions; The European charts are ruled by Football Manager 2008 (no surprises there), while the Japanese charts are lead by Seaman 2 (High five to that grumpy sea creature!). Couple that with recent sofware such as Sega Rally, Virtua Fighter 5 and you could say it's a good time to be a Sega freak! In Segacollection.com news; I did another Game Gear review (about time the system got some more attention here I think) of Kuni Chan no Game Tengoku and I uploaded an ancient interview with Tom Kalinske (back from the CES days!) to the specials page. After recent contact with Richard Jacques I was told that the storming Sega Touring Car remix (see January 1 update), was indeed his. Hope he doesn't mind the track being for download. I could've done an interview but lets not fall into the cliché trap shall we? -best of all- Landstalker. 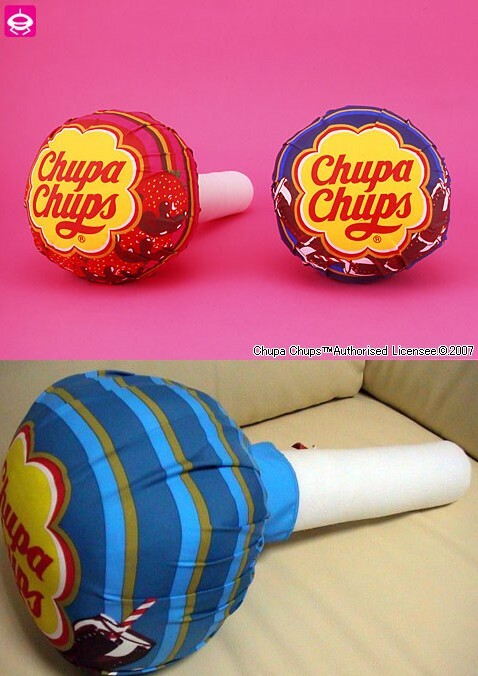 Finally, Sega Toys didn't fail us either with the release of yet another crazy UFO catcher prize, indeed it's a life-size Chupa Chups pillow. They didn't go 'soft' (geddit), however, because they also released this ugly motha. 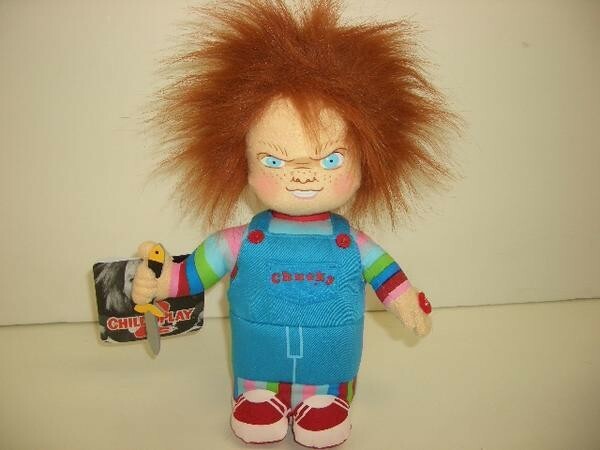 "Wanna play?" 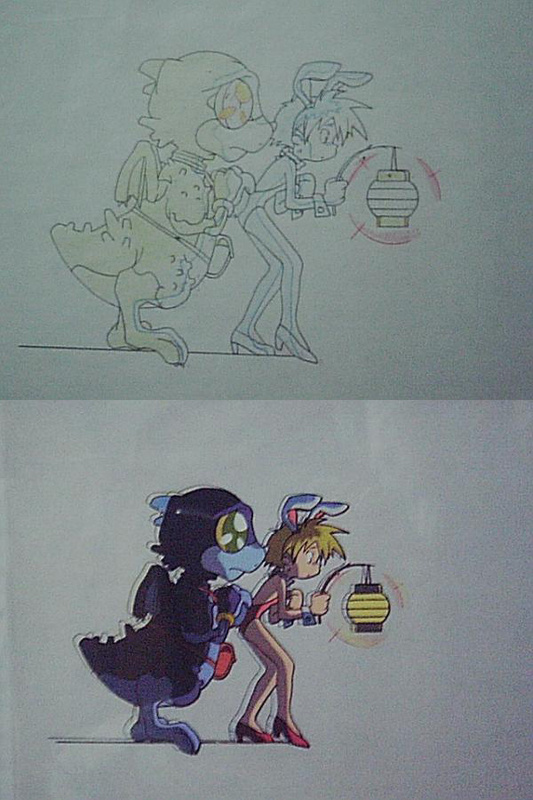 The SEGA community on the internet was kinda quiet but here's a couple of things of note; Rockin' B opened the C4 2007 Saturn coding contest (these entries get better each year!) and Redspotgames announced two new Dreamcast projects (to be classified as homebrews), one of them being a puzzle game called Wind & Water. *Added an (original) Space Channel 5 screensaver to the downloads section (doesn't work with XP a.f.a.i.c.t. X_X). *Added a new special called: The Desk of Doom. Go check it out. Finally, here's the new 'monthly old picture found somewhere on my harddisk', the mighty tower of power! I did another 'Show me some SEGA!' show overview: The E3 1996! Anyone with pictures/footage or more information about the show please mail me. I also uploaded some new footage to my Youtube page including a video of an early version of Tomb Raider (SS), a short blurb of Sega Rally 2 networking (DC) and some incredibly rare footage of Planet Ring, the PAL online-only game (DC). To celebrate the upcoming release of Sega Rally as well as the recent XBOX marketplace demo, I added a funky remix of the Saturn original to the downloads section (The Trip Hop Mix by D'Cruze, make sure you go to the soundtest menu of Sega Rally and test all the SFX. Then you'll understand why this is such a genius remix). I also did another magazine overview: Saturn Super 1995 special. Aaand here's a new feature called 'monthly old picture found somewhere on my harddisk'. This month: four people wearing SMS 3D glasses. 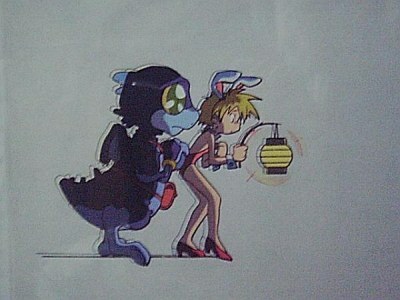 An image I found on a Japanese Master System club website roughly six years ago. Uh..enjoy! Despite being unannounced that it was going to be released today; Streets of Rage 2 made Xbox Live arcade! I'll be playtesting this bad boy tonight! Vote for the next release HERE! I brought back one of those classic reviews but this time with even better screenshots and more info; Keio 2! Also back from the dead; SSM top tens! *Waiting for email responses *New Saturn prototypes..incooomiiing! *The piles of dishes in my sink *Site stats; finally picking up again! *The amount of wires that clutter my desk *General feedback on stuff I did. *Taking out smelly trash *Those cheap cans of energy drink..ah bless 'em..
*Dropping things in the loo (don't ask) *Giving this site the kick up the arse it needed. These reviews always take loads of time to do (playing the game, doing screenshots, writing the review), but here's another one: Lost & found volume 2. Spread the word! Some general fixes here and there, but more importantly a new feature Battle of the Saturn Freaks and a new show added to 'Show me some SEGA'. I finally got an internet connection at my new place so expect more updates soon! Very late but the content of this update should make up for that: Download Sonic Xtreme for the Saturn! Wooo! This is an early version with not much content, but nevertheless..it's rather special, wouldn't you agree? This is the last update from the old Segacollection headquarters, as I move to a new place this weekend! Check another lovingly crafted bit of info at the obscure SEGA of the week and meet you in a week! So it took another month for an update. Urgh. I've been so incredibly busy, you really don't want to know. Anyway, I've found some time to prepare so more stuff. I -finally- did an update to the obscure SEGA object special (with more objects coming soon) and I did ten more Saturn Japanese software shortcuts (Actua Soccer, Bloody Factory, Hyper Reverthion, Mizubaku Adventure, Ohsama Game, Return to Zork, Side Pocket 2, Steamgear Mash, Toshinden S, UNO DX). Look out for a rather enjoyable read soon..
With such abysmal traffic lately, maybe this bumper update will help. I brought back the review of Ultimate Qix, the Saturn Super magazine overview and I updated the Sega lots special. Also make sure you check out Sega Europe's blog and Gamespot's SEGA special. I brought back one of the groovier features of the old Segacollection site; Show me some SEGA. The first show overview is online (featuring the E3 1997) and includes a very cool video featuring loads of Saturn games, including several unreleased ones! I could've dumped the video on Youtube and embedded it, but who wants blurry-vision™ rubbish when you can have a direct download? Exactly. Take care and 'till next time! After a nasty case of flu I'm back with more updates. I reviewed some games for the Game Gear (I'm starting to love the little machine a bit more) and brought back the UMK3 review. Look out for some tasty updates soon. As Karous seems to take ages to arrive, here's some other stuff to keep your busy. 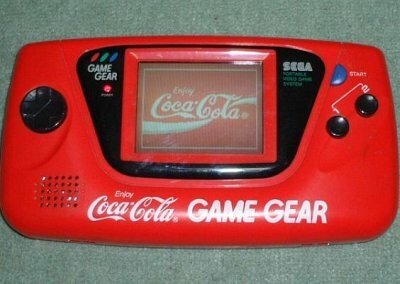 I added loads of new stuff to the link-up page (Game Gear compatible games, articles etc) and added some new downloads. (A Comix Zone track, a Burning Rangers track, a Frankenstein track, some new papercraft models and a Skies of Arcadia screensaver! And If all that wasn't enough already I brought back another interview; KinsukeJP. See you soon! It's been a while since the last new Dreamcast game review (April 2006 to be exact), but here's Trigger Heart Exelica! Another game got rated by Famitsu, indeed it's Karous. Scoring 7/6/6/6 it seems on par with Trigger Heart Exelica (which came in at Segacollection H.Q. - review plus media this weekend). Also, I got some nice 32X shortcuts up, enjoy. Trigger Heart Exelica was rated by Famitsu scoring 7/6/6/6. Not exactly brilliant, but no one expected straight 8's anyway. It has probably found its way to the shops and naturally a review copy will be coming this way. I updated the link-up intro and added three entirely new specials; Online gaming intro & Duke Nukem 3D, check out the specials section for them. Oh and I brought back the Radirgy review as well, wahey! I added some new links and brought back the link-up gaming intro, compatibility list & media section. I brought back the magazine overview. The actual cover scans and an issue contents will be back a.s.a.p. It was about time I changed the site to get rid of the frameset and added some CSS stylesheets. The site design was already four years old and had plenty of flaws so a change was in order. Not everything works yet, but I'm working hard to get everything back up a.s.a.p. Lets blast into 2007 with this excellent track ; Sega Touring Car - Conditioned Reflex (STC Remix), find it in the downloads section! Not totally unexpected but sweet nonetheless: Milestone confirmed a release of Karous for Dreamcast! Release date: 8 March, 2007! You can bet your grandma's pants that I'll be emailing them now, as I'll be pushing them hard to add plenty of extra's this time around. We have entered the final month of the year, a year that has had its ups and down for all of us, and the same goes for SEGA. Expect the regular lookback feature at the end of the month. On the update part: I did the first issue overview of Sega Megatech. The youtube video of the week comes from a guy called 'daveeeed', doing a pretty decent rendition of the famous Outrun tune 'Splash Wave' on his brother's stratocaster! It's not up to Jimi Hendrix levels but hey, I like it! I had the strange urge to enter the world of Phantasy Star Universe so a PC copy is on its way to me. Don't be surprised to see some more updates relating to it in the future! If you live in Germany (or the rest of the world for that matter) you might be interested to hear about an actual new SEGA magazine that's being printed for the last couple of months! It doesn't have the 'official' tag but certainly looks very professional! Naturally, it's all in 'deutsch' but I wouldn't be surprised to see this magazine (or similiar ones) appearing in English. Segacollection.com would like to congratulate the Sega On team with the launch of their magazine and wishes them best of luck for the future! On the update part: I redid the Master System shortcuts, the others will follow. I forgot about the youtube video of the week last week, but here's another one you really should've seen. I posted it a long time ago on the forums (they'll be back soon, hopefully) so you might have missed it. It's the commercial for the Japanese version of Rez (PS2), and it's nothing short of genious. Check it out! Not one, not two but three issues of Sega Visions today, enjoy!